Google’s Pixel 3 is one of the best camera phones you can buy, but the competition is stiff. The iPhone XS can take equally great photographs — sometimes even better — than the Pixel 3, while the Note 9 often excels in low light. Can you really tell the difference? See for yourself. We’re comparing a handful of photos from the Pixel 3 XL, iPhone XS Max, Galaxy Note 9, and the Pixel 2 XL (for those of you thinking about upgrading). If you have an iPhone XS or a smaller Pixel 3 or Pixel 2, expect the same image quality because the cameras are the exact same between the smaller and larger phone. A few notes: These smartphones all take excellent photographs, and we’re going to be nitpicking to find the best. We used the automatic settings for every shot, because that’s how most people take photos in real life. You also may not agree with some of our winners here, and that’s completely OK. There are technical reasons to like a photograph over another, but it’s also a very subjective choice. This also isn’t the most scientific of tests, but we tried to do our best. Either way, if you have one of these phones, you absolutely won’t be disappointed with the camera. You can expect almost any smartphone — even most budget phones — to take killer photos in broad daylight. All of these phones excel here in this photo of the downtown New York City skyline, but there are differences. It’s incredibly tough to pick a winner, but our least favorites are the iPhone XS Max and Note 9 photographs. The iPhone photo has a bit too much of a blue hue throughout, making the sky look a little unnatural and the buildings a tad washed out. The Note 9 photo has warmer toned buildings, but everything is slightly overexposed — look at the clouds, and you’ll see a lack of definition compared to the other photos. That being said, the iPhone XS photo has the best detail. Take a look at the Venmo billboard on the bottom left corner. You can read the Venmo logo on the card easiest on the iPhone XS. But the Pixel 2 XL and Pixel 3 XL photos have good contrast, which is why we like them the most. We like the Pixel 3’s blue sky, and it has the best-looking clouds. We also like the Pixel 2 photo’s buildings, which are slightly brighter. If we had to choose a picture to share, we’d go with the Pixel 3 XL photo. Again, this is a very close test, and judging them alone, we’d share all of them. It’s a little easier for us to choose a winner here, and it’s the Pixel 3 XL again. The Note 9 and iPhone XS Max photos have too much of a yellow hue, taken from the walls, that extend to every part of the photo. Even the skin tone of the girl is unnatural, and the clothes have a yellowish hue. Zoom in on the face, and there’s some visible noise. The Pixel 2 XL loses out because the photo is blurry overall. We’re not sure if it was due to camera shake or something else, but the optical image stabilization in the phone should have compensated for slight movement. That brings us to the Pixel 3 XL. The subject sharply sticks out from the background, thanks to the more natural colors in the photo. There’s excellent detail from the denim jacket to the subject’s face — and while some noise is still visible, it’s not as noticeable as the Note 9 or iPhone XS photo. In this portrait photo — which wasn’t captured with Portrait Mode — we see how each of these phones handle several components, from skin tone and depth to detail and color. The most detailed photos comes from the Pixel 2 XL and Note 9 — zoom in and the evidence is clear. The most natural colors are in the Pixel 3 XL photo; the subject’s skin tone is too red in the Pixel 2, iPhone, and Note 9 photos. The photos with the best natural depth are from the Pixel 2 and iPhone XS Max, but the Pixel 2 XL photo has too much of a red tone throughout. Overall, we like the iPhone XS Max photo the most. The colors aren’t as natural as the Pixel 3 XL photo, but it does a better job than the rest. It has good enough detail, but the natural blur and the background are the best out of all the photos. This is a tough one. Once again, we love the Pixel 3 XL photo the most. It’s incredibly detailed with great white balance, very little noise, and the lights are well exposed. The Pixel 2 XL photo isn’t as sharp, and the Note 9 photo feels flat because it lacks punchy colors and the lights are overexposed. That brings us to the iPhone XS Max photo. It’s the most representative of what the store’s ceiling actually looked like, but it goes overboard in making everything look a little too orange. The glasses on the bottom right shelf, for example, were more white in reality. Look back at the Pixel 3 XL photo now, and it looks a little too cold. It’s not as festive or fun as the iPhone photo. Our favorite would be somewhere in between, but since we have to pick a winner, we’d go with the Pixel 3 XL photo and edit it to warm it up a bit before sharing it on social media. We’d prefer to do this than tone down the iPhone photo because the Pixel 3 XL photo really has more detail — zoom in on the single large light in the middle left of the photo. Look at the steel bar. There’s more detail and less grain on the Pixel 3 photo. It’s the best one to edit. These photos were captured at the New York Coffee Festival, where the space is packed to the brim with people holding cups of coffee. It’s a good way to see if these phones can quickly capture photos in weird angles and not produce a blurry photo, because you’re often dealing with poorer lighting and a lot of crowds moving around you that could cause you to shake. We tried to minimize our movement as much as possible. Zoom in on the coffee beans, and the Pixel 2 XL — the only 2017 phone on this list — does the best job. It’s the sharpest, and if you zoom out a little more, it has the most natural-looking beans. 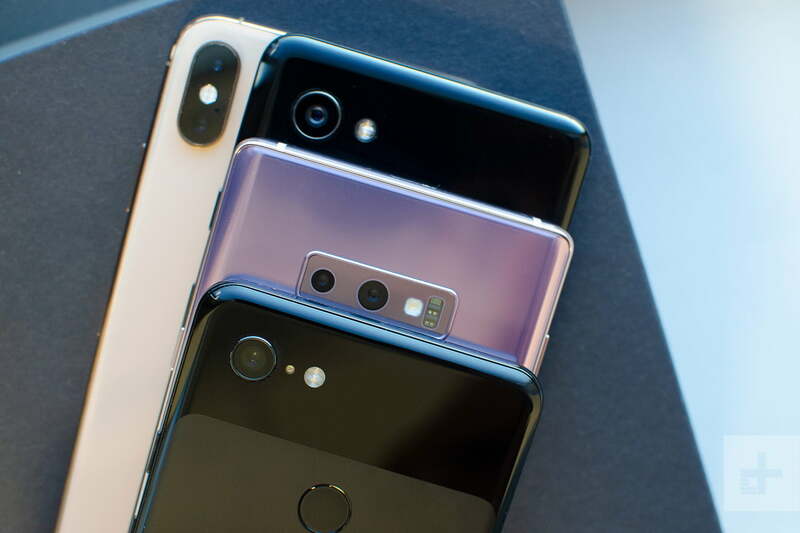 We’d say the Pixel 3 and the iPhone XS come in second and third place, respectively. The Pixel 3 is sharper than the fuzzier iPhone XS photo, but it also cranks the saturation but a little too high. The Note 9 lags — the beans look relatively sharp, but the tablecloth looks like it’s fading out of existence for some reason. First off, do not take the sharpness of the spinning wheel in this photo into consideration. It was spun in a few photos, and it may have stopped in others, so we’re not counting it as a major factor here. We like the neon sign in the iPhone XS Max photo the most, because it handles noise reduction the best, but there’s a lack of contrast here that makes the black wall not as black as we’d like. The Pixel 3 XL and Note 9 have the best details — look closely at the globe and you can almost make out “Mediterranean Sea” on both these photos — but the former is a tad too saturated. The Pixel 2 XL has the most natural colors throughout, but zoom into the neon sign and it has trouble with noise reduction. The Note 9 handles the neon sign well, but there’s a lot of grain creeping in through the rest of the photo. If you look at the people in all of these photos, it’s the Pixel 2 and Pixel 3 that have the least grain and offer more detail. We think the win goes to the Pixel 2 for having slightly more natural colors, because the Pixel 3 is a little more saturated. This is a tough photo to judge because they all do a solid job, but also because people are constantly moving at this stall. The iPhone XS Max stands out here. It lights up the scene well, it’s not too grainy, and it’s sharp. The Pixel 3 XL and Note 9 photos are certainly moodier, but the former is blurry, and the latter cranks up the saturation too high and doesn’t light up the wall above the sign at all. The Pixel 2 XL photo is simply overexposed and grainy. Each of these photos have flaws, but there’s only one that simply looks stunning: the Pixel 3 XL. Zoom in on the building to the right, and you can see it clearly has the best detail of the lot, with the least grain. The colors are also wonderful. The only flaw here is the sky on the left side is just a tad overexposed. The Note 9 comes very close, but it completely masks the buildings in the foreground. The iPhone XS Max has a great sky that isn’t overexposed, but the entire photo is drenched in yellow hues and looks murky. The Pixel 2 XL photo has a bluish tint, and it overexposes the sky on the left far more than the Pixel 3. You may have a favorite look here, but we can’t stop staring at the Pixel 3 photo. Let’s take out the Pixel 2 XL and Note 9 out of the running here. The Pixel 2 photo is too blurry, and the Note 9 — while sharp in some areas — loses detail in others, and it overall has too much of a strong orange hue. We think the iPhone XS Max photo has stronger detail here over the Pixel 3 XL: Look at the edges of hair around the dog and you’ll find you can identify individual hairs on the iPhone photo a little better. That being said, the iPhone XS photo is much darker. With a bit of brightening, the iPhone XS Max photo is the strongest choice here. However, if you wanted to share a photo without any editing, the Pixel 3 is the way to go. We’re giving the iPhone XS the win here, because it has the best detail. This bowl of ramen was delicious, and it’s something we had to photograph. The Pixel 3 XL takes the cake for having the best detail. Look at the bowl in the back and you’ll see it white balanced it and the wall really well. The Pixel 2 XL photo comes second, and while the colors are a little more realistic than the Pixel 3, the detail isn’t as strong. The bowl in the back is much darker, but we do like how it spreads the reflection of the neon light in the broth. The iPhone XS photo isn’t as sharp and has a lot of noise, and the Note 9 photo is sadly a bit of a joke. If you try to take a Portrait Mode photo of food in not-so-great lighting, you’re going to have a very tough time with the Note 9 and iPhone XS. In fact, the Note 9 simply said it could not take a photo due to lighting conditions, which is why it’s missing here. The iPhone XS nearly didn’t make the cut, but we managed to get it to work after moving a good distance away from the bowl of ramen. The end result is decent photo, but it wasn’t the original effect we were going for. The Pixel 2 and 3 didn’t have any problems. Both are sharp, with the Pixel 3 having slightly punchier colors. We’re giving it a tie between the two here. We’ve always found Google’s Pixel phones to have the best selfie cameras around, and that rings true here. The iPhone XS and Note 9 are knocked out easily. The iPhone photo is too soft, though it has nice colors and the best HDR work in the background. The Note 9 is also too soft, but it’s overexposed in the back, with poorer colors. It’s difficult to crown a winner between the Pixel 2 and Pixel 3, but we like the more natural colors from the newer phone. Both are equally well detailed though. The Pixel 3 XL and the iPhone XS Max come very close here, but we have to address the different styles of portrait mode between the two. Apple follows a different strategy with Portrait Mode over Google. You get a radial blur, with bokeh forming around the subject’s face and getting stronger further away. Google, on the other hand, tries to get the subject entirely in focus. Apple has a more traditional approach, but we like Google’s just as much because there’s a stronger emphasis placed not just on your face, but what you’re wearing. We’re taking out the Note 9 here because the subject’s face is blurry and overexposed. While the Pixel 2 XL does a solid job, it messes up the hair over on the left side of the face. It also adds a slightly less realistic color tone to the face. We like both the iPhone XS and Pixel 3 photo. Both have lots of detail, and you can see the radial blur circling around the subject’s face in the iPhone photo, whereas everything about the subject is in focus on the Pixel 3 photo. So why does the iPhone XS get the win? The background is better white balanced, whereas it’s more yellow in the Pixel 3 photo. This one’s easy. It’s a low-light photo taken with the selfie camera with Portrait Mode. Let’s take out the Pixel 2 XL for being blurry. The Note 9 is out too, as detail isn’t as strong and the background is overexposed. The iPhone XS does a great job, but it’s grainy and not as sharp or bright as the Pixel 3 XL photo, which takes the cake. Three of these Portrait Mode photos are excellent. Can you guess the loser? Sorry Samsung, the Note 9 photo is simply too overexposed, and it has an unnatural hue. All three of the rest of the phones offer strong detail, with accurate cutouts of the subject. While the Pixel 2 XL does the best job not overexposing the light hitting the subject’s head, it comes in third for the background, which has a reddish hue. It comes down to the iPhone XS and Pixel 3 photos, and this is going to heavily rely on personal preference. We love the airy, cinematic look of the Pixel 3 photo. It brings out the character of the subject a little more than the iPhone XS photo. All of these photos were taken standing in the same spot. The iPhone XS and Note 9 cameras just zoom in closer for Portrait Mode photos. Either the Pixel 3 or iPhone XS could win here, but we’re giving the edge to the Pixel 3. Here’s another easy win for Google’s Pixel 3 XL. The iPhone XS and Note 9 asked us to step back to get Portrait Mode working, but the end results are quite poor, especially the Note 9. The iPhone XS does a little better, but it’s still dark with weak details, and some parts of the blur are messed up. The Pixel 2 does an excellent job, like the Pixel 3, but it’s a little darker. The Pixel 3 wins. Google’s Pixel 3 has a nifty new feature called Super Res Zoom. Instead of adding a second camera for optical zoom, Google is using artificial intelligence to improve digital zoom by reducing noise and increasing brightness. The results are often surprising. Most of the time it can’t beat the 2x optical zoom on the Note 9 or the iPhone XS — especially in well-lit scenarios — but zoom in all the way and it’s a different story. The Pixel 2 XL will not get Super Res Zoom. We typically don’t recommend zooming in all the way on your smartphone camera, because the results don’t often look good. Even with the Pixel 3 XL’s Super Res Zoom, don’t expect to magically get amazing photos. That being said, we’re surprised at how well some phones performed over others. The worst in this grouping is the iPhone XS Max. It’s too fuzzy overall. The Pixel 3 and Pixel 2 photos are similar with strong contrast, but the trees in the Pixel 2 photo are too dark. The Note 9, we think, does the best job here. It’s not as saturated as the Pixel 3 photo, but it manages to capture the detail in the letters of the words. Samsung nets its first win! Here we test out the digital zoom on the Pixel 3 XL and Pixel 2 XL over optical zoom on the Note 9 and iPhone XS. This is a subject that was moving, so it’s tougher all around for the Pixel phones, especially since both cameras on the XS and Note 9 have optical image stabilization. We attempted a similar 2x digital zoom on the Pixel phones. We’re removing the Note 9 from the race here, because the photo is blurry. The iPhone XS does a good job, but the Pixel 2 and Pixel 3 edge out with slightly more detail on the man’s left hand. The Pixel 3 goes ahead to be the overall brighter image, and wins this one. The Pixel 3 is the best camera phone, at least according to this test. But keep in mind that out of its 10 wins, the margins were thin for many, and the iPhone XS was often close behind. Apple’s phone comes second with four wins, the Pixel 2 got three, and Samsung’s phone only got one. All four cameras took some stunning photos, and while have many more photos to share, we’re calling an end to this comparison for now. We’ll be taking more comparisons over the next few months and you’ll be able to find them here.